Design, easy to maintain and ideal to easily achieve energy savings, outdoor solar lights have the wind in its sails. But how does it work? How to choose and use it well? With iDLights.com, take advantage of its assets and offer yourself 100% ecological lighting! How does solar garden lighting work? 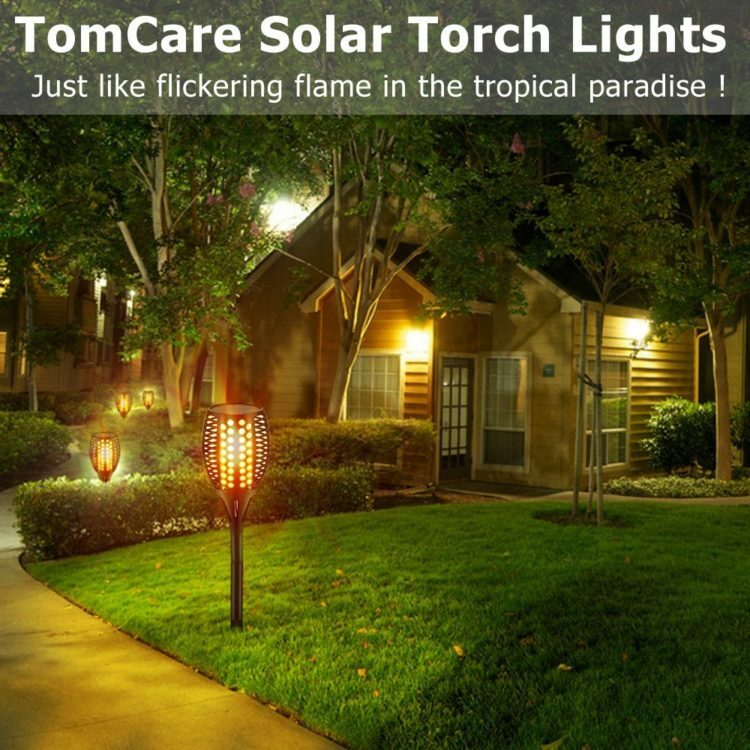 How to choose the right outdoor solar lighting? How to install solar garden lighting? How to maintain your solar garden lighting? When does solar garden lighting work? Should solar garden lighting be recycled? Running on solar energy, the batteries of the outdoor solar lights are recharged during the day to illuminate during the night. They work thanks to a system of LEDs and photovoltaic sensors, which store the energy under the effect of the sun and restore it when the night falls, turning on automatically thanks to a sensor of darkness. 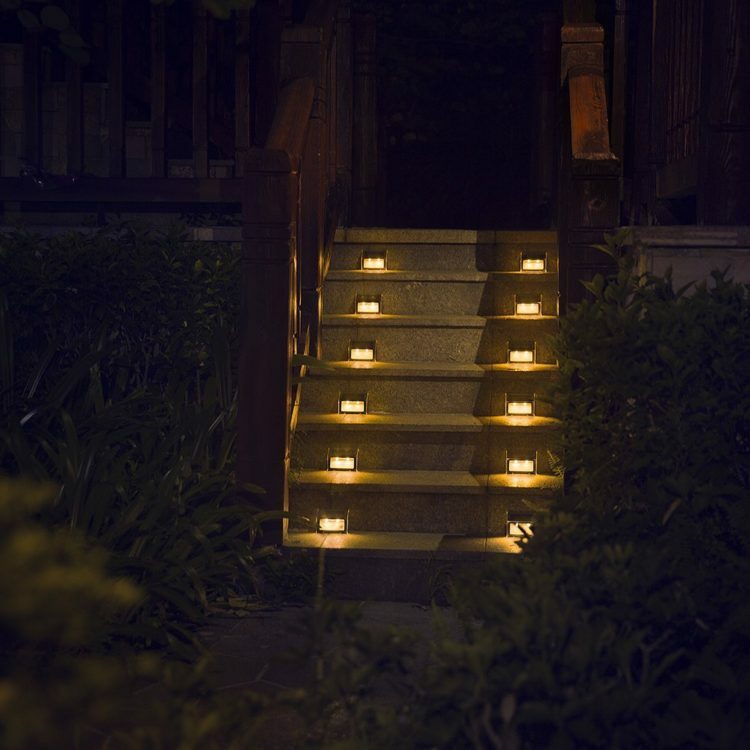 Practical to use and 100% ecological, the outdoor solar lights thus make it possible to light your garden without needing a connection to electric cables. There are 2 types of solar lighting: solar terminals, small size or street lamp, more or less 1 meter high, whose lighting power is stronger than solar terminals. Choose them according to the light intensity you need. 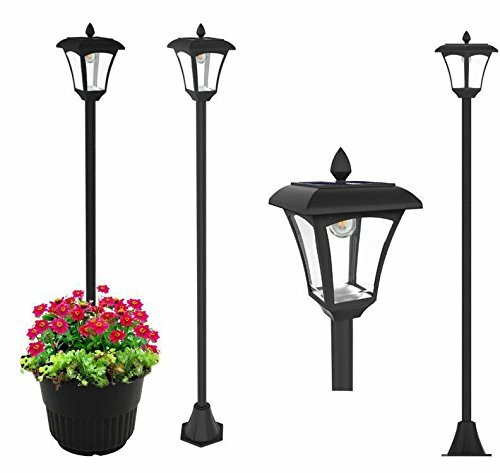 There are different types of solar lighting: solar beacons, solar terminals, solar lamps, solar pavers, recessed solar spotlights… This type of lighting is aesthetic and ecological. 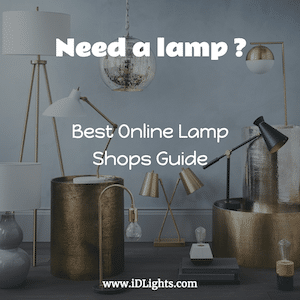 How to find your way around and how to choose the right solar garden lighting? First of all, you must take into account the light intensity of the lamp. Know that it is better to rely on Lumens than Watts. Indeed, the lumens are a more reliable unit of measure, because the Watts is not revealing of the real luminous power, it is about the consumption, and the lumens vary according to the quality of the leads. It is important that the lamps in your solar lighting (lamps and photovoltaic panels) are ideally located. Avoid areas of shadows, even partial, at any time of day. It is the direct solar radiation that offers the possibility of recharging your lamps in an optimal way. Some lamps have an integrated solar panel. They must also be placed in sunny and open areas (no shade areas, no foliage, roof projections, etc.). Also, do not mount your solar lamps on a north side of the building. To equip your garden with quality equipment, remember to check the following points when you make your purchase: your outdoor solar light must be equipped with a long life battery, guaranteeing to run at least 8 hours after a day of charging. An important feature not to find yourself in complete darkness in the middle of the night. Also, choose a lamp of good power in order to benefit from a quality lighting (at least 12w). Opt for material with LEDs, resistant to water and thus to bad weather and provided with changeable batteries (if possible 2 or more interchangeable batteries). Depending on your wishes, choose lighting options that offer continuous or intermittent light intensity. The right options: lights with a presence detector (which lights up when you pass in front) and those with a UV filter to extend its life and avoid its degradation under the effects of sunlight. A solar lamp for the garden uses solar energy. It is, therefore, an ecological lighting mode that is easy to install and does not require any specific connection. However, to enjoy it as long as possible, it is essential to know how to choose it well. Before buying an outdoor solar lamp, check that its battery offers a good autonomy, i.e. an autonomy of 2 h minimum in winter and 10 h minimum in summer. Also, check that it has a power of at least 12 watts to ensure sufficient lighting. Choose a quality solar lamp with a good life, unlike a cheap lamp that will stop working after two or three years. Make sure that a solar garden lamp offers good weather resistance. For that, one of the best choices is the stainless steel solar lamp: this stainless steel will not rust and will be resistant in case of wind or hail. To avoid the solar lamp being constantly lit at night and to avoid generating light pollution, choose a model equipped with a presence detector. In this way, the lamp only lights up in the presence of a person. To ensure that a solar lamp fits perfectly into your garden, don’t hesitate to choose a lamp with a design that matches your furniture, plants and garden style while being robust. Install your lamps according to your needs: to highlight the paths of your garden for example, or to illuminate you when you walk or drive by. The solar terminals are very simple to install: simply push them a few centimeters into the ground. Street lamps may require a little more installation time: they usually need to be saddled on the floor. If necessary, you can also apply them to the wall or on your terrace. The solar lamps adapt to all your desires! Just avoid places that are too shady, so that they can enjoy the sun, their essential source of energy. Garden lamps are simple to maintain: it is generally enough to clean the solar panel each season, in order to optimize their brightness and their lifespan. The batteries of solar garden lamps also need to be changed from time to time: usually every year on average. It is obvious that solar lighting works better in summer when the hours of sunshine are more numerous. But there are solutions so that your garden is also lit in winter! Some lamps are equipped with both a rechargeable lithium solar battery and an alkaline battery that takes over. These lamps are therefore hybrid. In winter, you can opt for solar lights with a motion detector. They are therefore only used occasionally, which preserves their battery capacity in the event of low sunlight. Whichever type of solar lamp you choose, solar lighting will enhance your garden at nightfall. Garden lamps may contain pollutants. Generally, it is necessary to return them to the manufacturer so that they can be recycled. They should not be thrown in your garbage can. Do not hesitate to ask your distributor for advice. 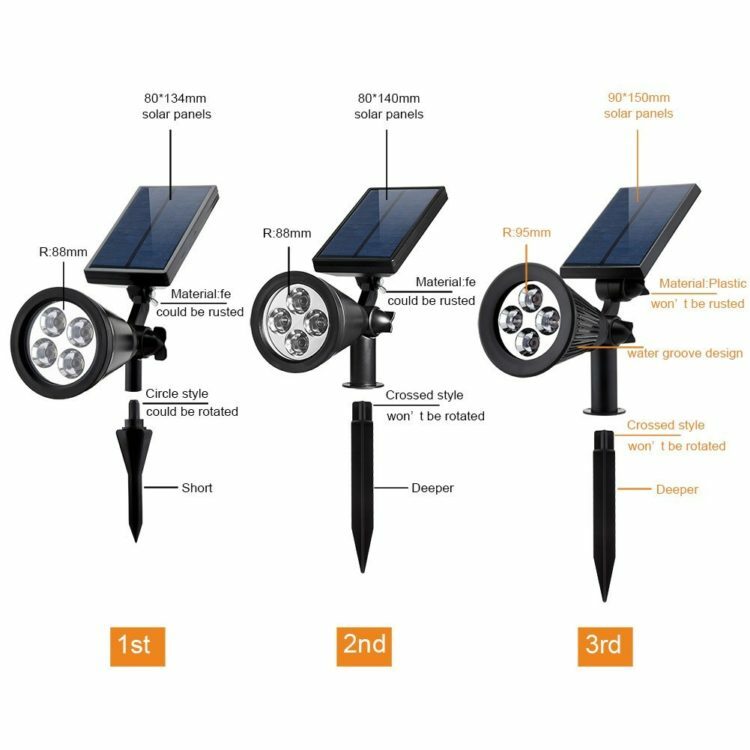 URPOWER 3rd Generation solar outdoor spotlights, rechargeable and adjustable solar wall lights / In-Ground Lights, easy to install with no tools. Waterproof and Durable, withstand all kinds of weather all around the year. The Solar Pathway Lights Bright clear light shines forth from each LED light. Perfect for any path. you can place them on the walkway, patio, garden, driveway, lawn, yard landscape or any other outdoor spot to light up the night. Compare with other single-mode solar lights, LITOM Solar Lights Outdoor bring 3 working modes to cope with different usage scenarios. Perfect for using on a front door, backyard, garage, driveway, deck, patio, even on RV. 100 Super Bright LED bulbs on a 33ft high-quality copper wire, with steady 360-degree viewing angle they illuminate in every direction. Ideal for decorating your gardens, patio, gate, yard, wedding, party etc. Beautiful artificial flower garden stake lights(Include purple and white lily lights). The flowers petal is exquisitely designed to imitate real lily flower, The material of the flowered are fabric. 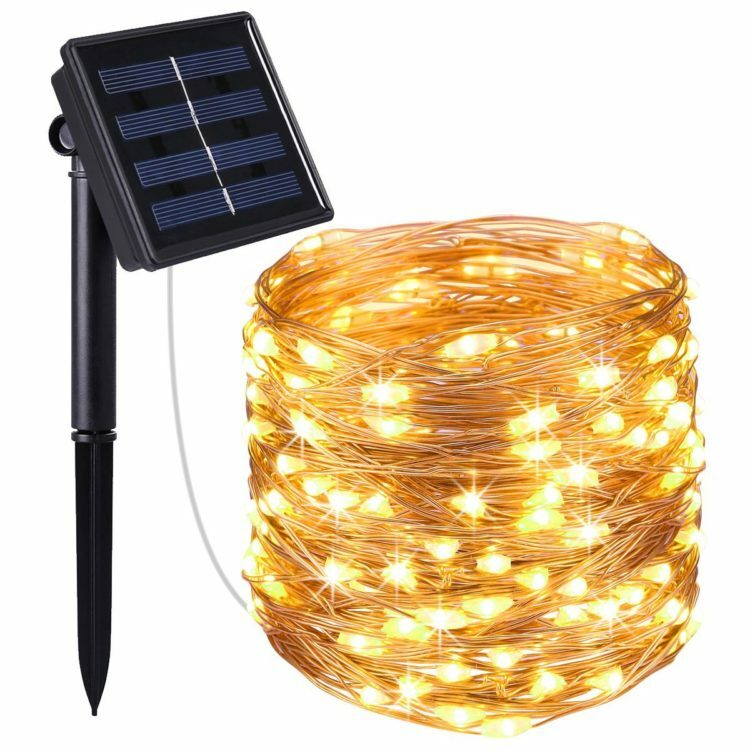 If you want to make your garden colorful, these unique solar lights will bring you the solar garden light decoration solution. There are 28 powerful LEDs and the motion angle is 120º which can provide excellent illumination and turn the dark space into a brightly lighted space. With a lampshade covering the led, well designed to longer its performance life. Days growing shorter, but you will never have to fumble for keys when you get home if you have this 2 pack solar lights. With 15 LEDs on both side, 30 LEDs can provide plenty of light no matter the time, compared to eight you’d find in most competitors, and picks up motion from 15 feet away. For 30 LED lights in the market, this pack is the most cost-effective one. EASY to USE: 1 set = 6 solar lights; Install the lights outdoors where they can receive direct sunlight, then keep the switch at "AUTO" position, they will automatically turn on at dusk every day. A safe alternative to the real “flames” — LEDs in the light cast a safe, soft, mood-enhancing glow. Please note the actual height of the item is 43 inches.